I received Dame Evelyn’s most recent album in the mail today, a superb collaboration with the Danish guitarist Jon Hemmersam. The track listing on the Gracenotes Database calls the music Jazz, but I don’t believe you need to be a lover of Jazz to like this album. The guitar playing certainly sounds “jazzy”, but the music transcends genres. All tracks are credited as improvised by the two players and very loose and free form. The music is outright endearing … but of course I must say that, because I am a fan – of improvised and abstract music as well as of Dame Evelyn, whom I have nominated the Patron Saint of my project. To Dame Evelyn making music is the same as making sound. Harmony or tunes and rhythm are unnecessary academic subdivisions to her. Her advice to me – to pass on to others looking for advice on how to set about making their own music – is very simple: Just make sounds, and then you’ll find you are playing music. And this attitude seems to be the driving force which powers much of the music on this CD. The recording is extremely lively – everything appears to resonate along with everything else. I have seen pictures of the sessions, where both musicians are standing at an open grand piano, with most of the instruments inside the piano. The resulting sound is incredible. I came across something like it done only once before, on an album by the flute player Bob Downes. It is the ultimate Prepared Piano, really. There are no enhancements or sweeteners of any kind added. As a consequence, there is some very faint equipment noise in evidence, like in the days before digital re-mastering. You’ll probably only notice it when the record ends, and not at all on headphones. 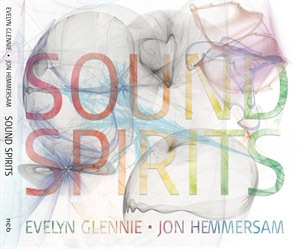 A new experience for me: Evelyn Glennie uses her voice! She doesn’t sing, it is more like … I don’t know, it is sort of sensual – listen yourself and tell me what you would call it. And she plays a Blues Harmonica on “Heart Cinema”. The spectrum of gestures and motifs covers the whole range of musical expression: everything is there in a dazzling sonic fireworks display which seems to go on forever. Outbursts of high energy and passages of quiet meditation are held together in a framework of bubbling joy and playfulness. However, don’t look for beats, tunes or pads – you’ll be truly disappointed. This is some of the best abstract free form improvised music available, almost an hour and a quarter of it!